Felix As Good As It Looks - Kitten has the perfect combination of proteins, essential minerals and vitamins that your kitten needs in order to grow into big and strong. Ideal fuel for the first year's adventures! Kittens have a lot of growing to do in their first year, these appetizing meal are specially formulated to provide 100% of your kitten's daily needs when fed according to the feeding guidelines. Your kitten will get all the necessary proteins, vitamins and essential minerals to help build strong muscles, bones and teeth to become a healthy and happy adult cat! Complete nutrition: Specially formulated to meet the high nutritional demands of kittens from weaning up until adult food. Energy-rich: Contains high levels of energy from quality protein and fatty acids that are essential for kittens' growth and development. Highly digestible: Meaty chunks in jelly that are made with high quality ingredients for an optimal digestion. Good pregnant and lactating queens: they too have high nutritional demands and require energy-rich food. Feed little and often to satisfy kitten's appetite. Kitten food can be left down so that your kitten can feed between meals if he is hungry. For pregnant and nursing cats, feed as much as your cat will eat. 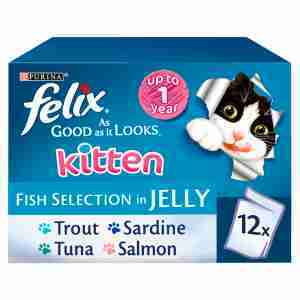 Food should be served at room temperature (then your cat can really enjoy the yummy smell of Felix too - bring it on!). Fresh, clean water should always be available. Age of Kitten 1-3 months, Typical Amount (Pouches per day) 1-4, Typical Meals (per day) 2 - 3 meals. Age of Kitten 3-6 months, Typical Amount (Pouches per day) 2 - 5, Typical Meals (per day) 2 meals. Age of Kitten 6-12 months, Typical Amount (Pouches per day) 5 - 3, Typical Meals (per day) 2 meals..